There seems to be many within close reach (as per screen shot) - are there any local's who can confirm whether the area is safe for pedestrians (pedestrians VS traffic)? It's a little difficult to tell from the satellite shot. 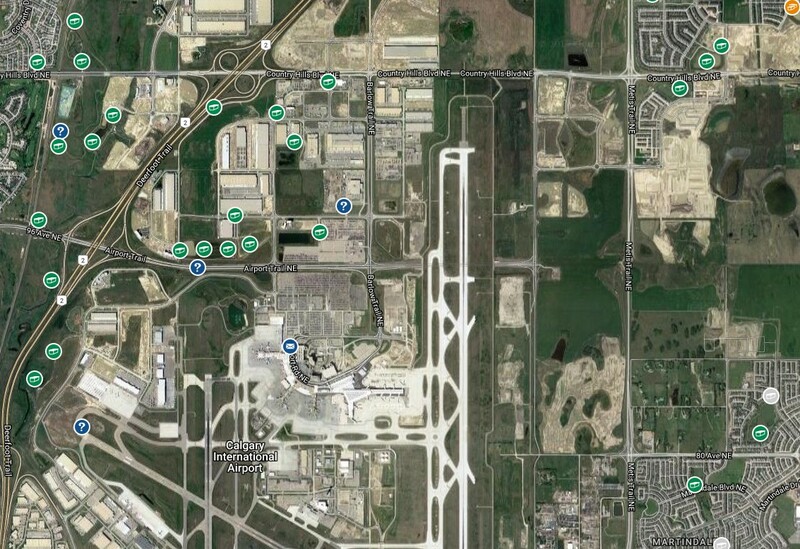 Hi!, I live in Calgary and can confirm that the 4 caches along Airport Trail just N of the airport are definitely within safe walking distance. You can cut through the parking lots most of the way and then there are lights at the intersection. Thanks very much JustKeepSmilin! I appreciate the info. I did this a year-and-a-half ago. I had a 3hr layover. Went for a walk I got three or four cache across that Highway. Totally safe totally doable totally easy nice flat ground.